Created in partnership with Parkinson’s UK, one of the world’s largest charity funders of Parkinson’s research, the Critical Path for Parkinson’s Consortium (CPP) was launched on October 14, 2015. Created in partnership with Parkinson’s UK, one of the world’s largest charity funders of Parkinson’s research, the Critical Path for Parkinson’s Consortium (CPP) was launched on October 14, 2015. This is a global collaboration that promises to pave the path to new treatments for Parkinson’s. By facilitating collaboration among scientists from the bio-pharmaceutical industry, academic institutions, government agencies, and patient-advocacy associations, CPP fosters consensus and data-driven research to increase efficiency, safety, and speed in developing new therapies. Traditionally, Parkinson’s has been viewed as a disorder in which individuals don’t have enough of a chemical called dopamine because specific nerve cells inside their brain have died. Current research indicates that the processes that lead to dopamine deficit start much earlier (decades) making it a pressing need to increase the understanding of Parkinson’s progression. It is CPP’s mission to serve as the main international vehicle to develop new, regulatory-endorsed drug development tools based on the most current scientific insights into early Parkinson’s, by combining detailed patient data, expertise in clinical trials from companies and academia, and the unique neutral facilitator role of non-profit organizations. “It’s our goal that the partnership with the Critical Path Institute will improve the clinical trial process and deliver new and better treatments, faster, to the people who urgently need them,” says Parkinson’s UK Chief Executive Steve Ford. CPP has collected and standardized patient-level data from PD patients around the world to develop a global integrated unified database. 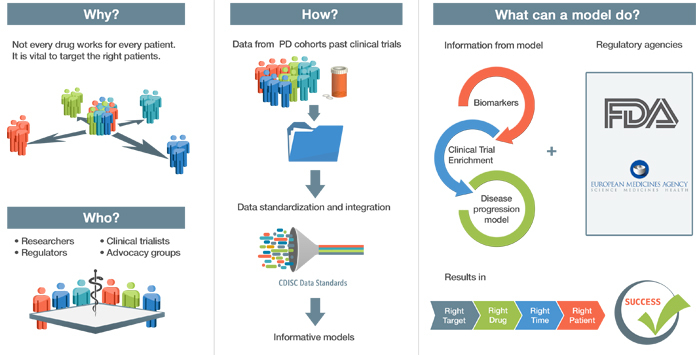 CPP aims to achieve global regulatory endorsement of novel translational biomarkers and drug disease trial models for use in clinical drug development trials. CPP focuses on early stages of PD, a time that offers the best chance for delaying disease progression. Early intervention is a priority need as expressed by patients. The Critical Path Institute’s (C-Path) Critical Path for Parkinson’s Consortium(CPP), in partnership with Parkinson’s UK, announces that the European Medicines Agency (EMA) has issued a positive qualification opinion on an imaging test (biomarker) as a tool to enrich Parkinson’s clinical trials. The purpose of this enrichment biomarker is to serve as a measurement that can be used to select people with Parkinson’s who are most suitable to take part in clinical trials. The EMA issued a letter of support on October 7, 2016, supporting the use of neuroimaging biomarker dopamine transporter imaging as an exploratory biomarker for early PD. The letter of support is a step along the way to CPP’s ultimate goal of achieving biomarker qualification with EMA. Why is EMA qualification significant? Qualification would relieve trial sponsors would relieve trial sponsors of the burden of having to convince the regulators that the biomarkers are reliable and reproducible every time they run a trial. Qualification could save both the regulators and sponsors time and money, which can incentivize companies to invest in more trials and increase chances of getting more Parkinson’s disease treatments approved. The US Food and Drug Administration (FDA) issued a Letter of Support for use of molecular neuroimaging of the dopamine transporter (DAT) as an exploratory prognostic biomarker for enrichment in Parkinson’s disease (PD) trials. This letter describes the FDA’s opinion on using a progressive loss of DAT as an exploratory prognostic biomarker to help identify patients with increased likelihood of having progression of PD symptoms. The FDA encourages the use of this biomarker in clinical trials to evaluate its utility for the identification of patients likely to show clinical progression of Parkinson’s motor symptoms.